The family and I took a quick trip to Arizona for my son to play baseball. I can't imagine many places hotter than Phoenix in July, but here we are and he has been playing baseball in 110 degrees everyday. (and yes, it's a dry heat - except when it's humid as all get-out and raining - which describes yesterday and today). Maybe not a silver lining, but a silver setting - with lots of turquoise. It was extremely difficult to fit in bead shopping between running to the baseball fields, carting around a load of 14 year-olds for food and entertainment - but yes - I managed to squeeze it in. 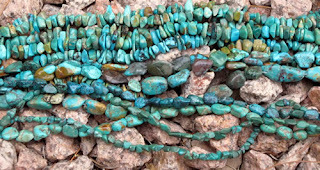 The store itself was not very exciting, but I found turquoise strands (real turquoise) for $25 per pound. 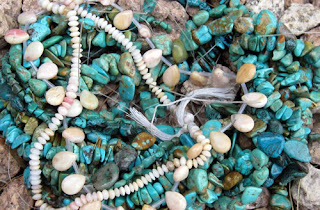 I figured it would be wrong of me to drag my fellow baseball Mom's and our daughters (who were double buckled in the back of a rented Audi) to a bead store and not buy anything - so a pound of turquoise strands are now mine. I also purchased a couple of strands of shell beads. Linked to this from WWJ just now... "only" $25 for one pound? Oh, my......... I wish I could go there, I'd buy 25 pounds! I love turquoise, too! Look forward to seeing what you make out of it.